(Phys.org) —For planet hunters, this has been a bountiful year. A team lead of astronomers at the SETI Institute and NASA Ames Research Center have used data from NASA's Kepler space telescope to uncover 715 new exoplanets. The newly-verified objects orbit 305 different stars, and therefore include multi-world systems that are reminiscent of the Sun's own planetary family. The announcement of these discoveries was followed by news that Kepler had also found the first Earth-size planet in the habitable zone of its star, Kepler 186f. This is a significant milestone in the task of determining the prevalence of terrestrial planets in the Milky Way galaxy. "These results are showing us that not only are Earth-sized planets common, but so are multi-planet systems containing potentially habitable worlds," notes Jason Rowe, a SETI Institute astronomer who co-led the study. "Most of the new planets orbit their host star much closer than Mercury, but a few are beginning to bear a similarity to our own solar system." 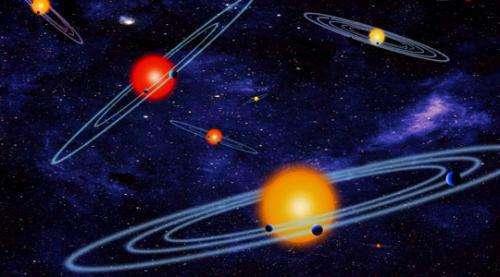 The deluge of new planets has been intensified by a new analysis scheme called verification by multiplicity. This technique can be applied to many planets at once, allowing the researchers to verify hundreds of new planetary systems in wholesale fashion, rather than teasing them from the Kepler data one-by-one as done in the past. The new technique uses probability arguments based on the recognition that, of the 150,000 stars observed by Kepler, hundreds were found that have multiple planet candidates. On this basis, the researchers are assured that their results are not distorted by binary stars that can mimic a multi-world system. The new discoveries increase the total number of known exoplanets to over 1,700. "From this work we've also learned that planets in these multiple systems are small, and their orbits are flat and circular, much like our own solar system," Rowe said. On April 17th, the Kepler team announced the discovery of Kepler 186f, the first Earth-sized planet found in the habitable zone of its host star, marking a major milestone in determining the frequency of Earth-like planets in the Milky Way galaxy. "Uncovering these worlds and showing that habitable worlds could be very common has increased the likelihood that there is life—perhaps abundant life—elsewhere in the cosmos," notes David Black, President and CEO of the SETI Institute. Data collection from the Kepler mission ended in the spring of last year, due to the failure of a second on-board reaction wheel, essential to accurate pointing of the telescope. However, on May 20th, NASA announced the approval of the K2 mission, intended to repurpose Kepler to use the pressure of sunlight hitting the side of the spacecraft to act as a third wheel. "We can't continue to look at the original Kepler star field," said Douglas Caldwell, Kepler Instrument Scientist at the SETI Institute, "but spacecraft are built and operated by very smart people, and thanks to the hard work of the entire Kepler team we can now search for planets in a wide variety of environments and conditions, including star forming regions. Doing so will teach us more about how our own planetary system formed and evolved." "The more we explore the more we find worlds among the stars that remind us of home," Rowe notes. There was recently affirmed one of the most precise cyclic events ever witnessed in the Universe, and that is of the observation of a variable pulsar star with a cyclic variation of not more than 1 second per century of observation, thus far. Over the very long term, that degree of stability could only be found in a very still and undisturbed environment, free from intrusion of any kind by any outside source. Even a single wayward comet brings into a solar system a new population of particulates and larger artifacts, each of which in turn has its own disrupting influence. Once that process of intrusion is started there is almost no possibility of reversion. As I see it, the greatest impact on the harmony of a stellar environment is the introduction of intelligent intent behind such intrusions. Logically then, we will probably find life in the most disturbed solar systems. It will be an irony of considerable magnitude to find that there is indeed a Planet X circling our sun. The Vega system has been found to include a Planet X as well, orbiting that star over a 2,200 year period in a direction counter to that of the other planets in that solar system. There is also an asteroid belt around Vega, the obvious result of a worlds in collision scenario of the kind as written up by Velikovski, and more clearly described in the Enuma Elish and translated and interpreted by Zecharia Sitchin in The Lost Book of Enki. Man, I wish the "gods" of Nibiru wouldn't name their kids after astronomical bodies. That can be so confusing. Velikovski [sic] -> Velikovsky used comparative mythology to try and make sense of celestial mechanics. Everything he said was BS. @baudrunner: wtf are you talking about? This is about planets... Wait, in the second comment there's a planet... X. Are solar systems disturbed or are you? @baudrunner: wtf are you talking about? This is about planets... Are solar systems disturbed or are you? Lay off the crystal meth and comprehend your reading @Anda. This is about the notion that life is more likely to be found on worlds orbiting suns in an unbalanced and unstable solar system. Study the shape of the orbits of the planets around our sun. Pluto is as much affected by the presence of a larger Earth size body around our sun than are Uranus and Neptune. Pluto cannot be responsible for the perturbations of the orbits of those two planets, therefore there must be another candidate in any event. Smart astronomers agree. I understand that creationists are reluctant to accept any possibility that their world view might not be accurate. I don't care. I'm a rational thinking human being who thinks that the idea of a person existing before anything else existed and making it all happen for just us Earthlings to enjoy is an untenable one. Velikovsky proposed a theory of planet and solar system formation and described a scenario that created the moon. He was probably right, and smart astronomers agree on that account. Your understanding of mythology is that it is all sci-fi. That's wrong. Myths are archaic anecdotal accounts based on very real people and events. Genesis 6:4 - "..the sons of the gods, etc.". Real people, my friend.